Diameter of 8mm, 12mm is readily available. Length varies from 25mm-60mm as per customers request. Customized lengths can also be made on order. These are made from teakwood. Wood dowels are cylindrical pieces of wood that can be used in woodworking, crafts etc as pegs, axles and support rods. These are available in a variety of diameters and length. 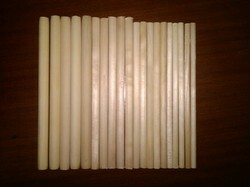 Wooden dowels of poplar, pine, hardwood form 5 mm to 25 mm dia, any length available. We are a renowned manufacturer, supplier, exporter and trader of Wooden Dowel. 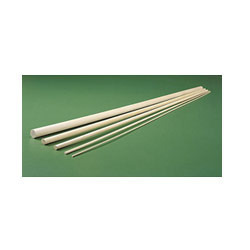 These Wooden Dowel have high tensile strength and high tolerance level. These Wooden Dowel are available at very affordable price. We have established ourselves as one of the leading organization, involved in offering Wood Dowel Rod. Our company is a recognized name in manufacturing Wooden Dowels Pins which are durable and are available at economical prices. These pins are made as per the client's design specifications and requirements. We are the most trusted name amongst the topmost companies in this business, instrumental in presenting Wooden Dowel.